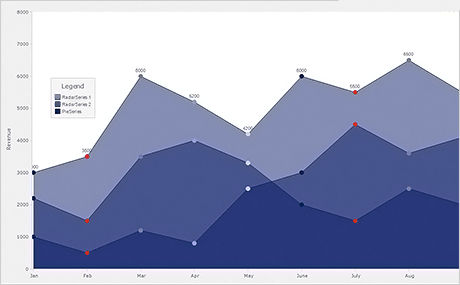 A smart .NET dashboard control with highly customizable charts and gauges. MindFusion WinForms chart control is so much more than just another WinForms chart control. This component truly has the ability to change and adapt to your application's needs in a matter of hours. Whether you need a 2D chart, 3D graphic, a sophisticated gauge or a precise financial chart - it's all included, right at your fingertips. MindFusion WinForms chart component reads data through a universal Series interface. This innovative approach allows the control to use literally any type of data source. You can create a custom class, which encapsulates the data you want in your particular case and assign it to the chart control. It will work fine as long as you implement the Series interface, which is a simple task. Another advantage of implementing the interface is that values are not copied into the chart's built-in data storage and performance is not affected by their data type and count. MindFusion provides several out-of-the-box Series implementations for all popular data formats - XML, database tables, DateTime values and numeric arrays. If you want to export the ready graphics a set of the most important output formats is available for you to choose from. You can create a PDF document or an SVG file, print the chart with the option of print preview or export it as a bitmap image. Each of these options will persist the graphic without any loss of quality or detail with a single method call. The WinForms dashboard control is designed to impress with polished looks as much as with a versatile feature set. 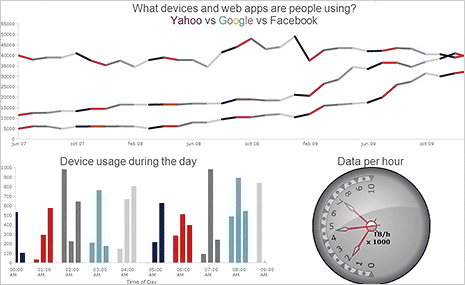 The component's API exposes pen, brush and font options for each part of the chart. All your appearance modification can be saved in a theme and re-used at your convenience. For a quick chart revamp you can apply one of the predefined chart themes - they are all based on harmonious colour palettes provided by professional decor designers. The dashboard control arranges unlimited number of chart plots and gauges. 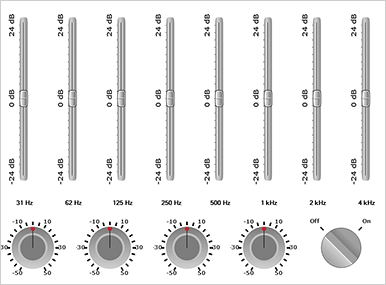 The order of arrangement is decided by you - the component's dynamic layout system allows any control positioning as long as you find it appealing. Each plot can display multiple axes and charts of different type. Legends can vary in size and count and you can place them wherever you find suitable. Finally, you can use the additional WinForms text, border and image controls to bring clarity and decoration to your dashboard. With such a powerful set of features you will definitely love the end result! Each chart type represented in the control supports unlimited number of series and a long list of customization options. Line charts can be drawn as steps, curves or straight lines. Scatters can be added at data points or you can have just a scatter chart. Bars can be organized in groups, stacks or clusters. The count of axis series is unlimited. Each axis provides its own set of appearance settings, which lets you give it a unique look. The control supports different label types for each chart type with multiple label options and settings. 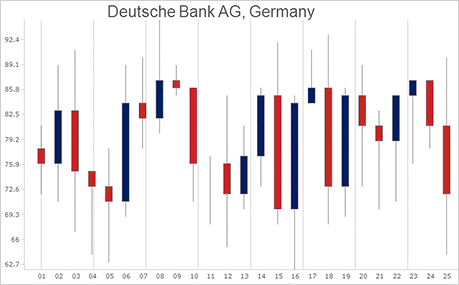 For business applications there are the candlestick charts. Bubble, radar and polar charts are also among the options. The gauge controls provide a lean interface to design any oval or polygonal gauge with a comprehensive set of gauges already defined with the sample projects included in the control. 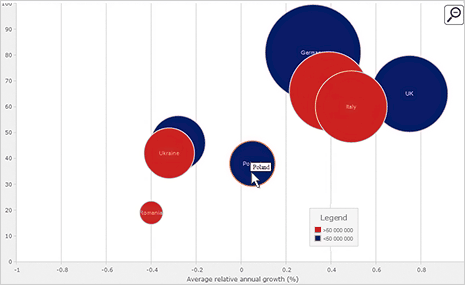 The WinForms chart control handles with ease panning and zoom even in charts with large data series. 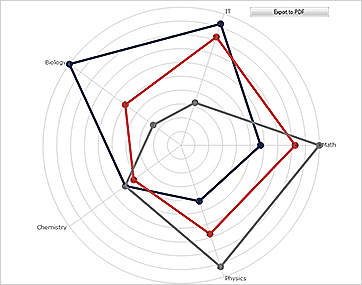 Pie and radar charts can be rotated just by dragging them with the mouse. Legends can also be dragged and positioned dynamically at the best location on the current chart. Hit testing is supported for all chart elements and you can quickly identify the active element and modify it as you wish.